The strident obsession with racism and political correctness permeating the academy and media, and a profound ignorance of our history mean that practically useful publicly available analysis of the issues is rare and endangered. The voices of the dispossessed, the marginalised, those who suffer most are routinely ignored in the clamour. Of all those who see racism where there is none, the noisy gaggle of the perpetually offended who took offence at a recent Bill Leak cartoon in The Australian rank among the gold medallists. As we all know, the cartoon depicted an Aboriginal copper speaking with a neglectful Aboriginal father about parental responsibility. Leak certainly ruffled the feathers of those who have been asking themselves the key question while never bothering to assimilate the evidence of cause and effect: “Shockingly high rates of child abuse and neglect in Aboriginal communities has been no secret for such a long time, so why haven’t we been doing anything about it?” To those asking themselves that question, I can well imagine your frustration, the need to find someone, anyone, on whom to target your angst. Many allegations of racism were directed at Leak and his cartoon, but no plausible explanation of its alleged racism ever emerged. Why? Because it isn’t racist. Once the accusation of racism is made it is taken as truth, no justification needed. Anyone questioning the claim can expect to be immediately dismissed as blindly indifferent to racism, unfussed by it or, indeed, a racist himself. This is why accusations of racism are common: those so accused fear being branded a racist. The race hounds need to understand an elementary rule of debate is that the burden of proof resides with the claimant, not the sceptic. Flinging the accusation of racism is a simple business. You make the charge and wait for a howling chorus of the likeminded to do the rest. There is never a shortage of voices clamouring to join the mob. At least three methods have proven very effective in bolstering claims of racism. First, state your claim confidently and use a word like ‘blatant,’ as did Celeste Liddle when writing about Leak’s cartoon. “It was extraordinary the lengths people went to justify what was blatant racism,” she snarled. “Will we ever be able to go even one week without some incident of racism aimed at Aboriginal people hitting the papers?” I think a better question would have been: “Will we ever be able to go even one week without some activist misinterpreting a non-racist incident as actual racism against Aborigines?” Liddle continues, “Leak’s cartoon, while clearly racist …” Like so many others, she never bothered to explain why his barb was a manifestation of racism. For her purposes and to signal the mob, the charge itself was enough. Editor-in-Chief of The Australian Paul Whittaker tried to argue that his paper’s choice to publish it was about fostering discussion. He then highlighted some views of conservative Indigenous commentators Marcia Langton and Noel Pearson as validation without first checking with them to see whether they were okay with their views being used to justify Leak’s cartoon. Actually Celeste, a newspaper editor does not need to check with Langton and Pearson to use their views, as they are already stated on the public record. The second rule for pasting the racist label on others is to be emotive, as florid language can be very handy when propping up a weak argument. Amy McQuire of the Brisbane Indigenous Media Association is quoted as being outraged about the cartoon and as calling on Leak to resign. But does being outraged necessarily mean that the cartoon is racist? Perhaps such a response says more about the critic. An ounce of sensible reason as to why the cartoon was considered racist would be far better than a pound of outrage. Alas, that is not the way the game works. McQuire proceeds, “If Aboriginal Australians wanted to have conversations about the problems within their communities, they should have them themselves.” They have been having these conversations for a long time and it has not yielded the outcomes hoped for. Let’s be clear here, Aboriginal affairs is everyone’s business. For as long as Aboriginal Australians are diminished, all Australians are diminished. More than that, for as long as Aboriginal children are at greater risk of requiring out-of-home care, every Australian parent should be concerned. The rhetoric of “conversations with themselves” only further reinforces the us/them mentality which is highly destructive. Third, quote someone who agrees with you, particularly the holder of a prominent position, as did Chelsea Bond when she cited Professor Muriel Bamblett. The professor was quoted as saying the cartoon was “deliberately chosen to insult Aboriginal people.” Chelsea then goes on, “As a daughter of an Aboriginal man and the wife of an Aboriginal man, I know that Bill Leak’s claim that Aboriginal fathers are neglectful is not representative of Aboriginal family life.” Really? We had to be told that? Was she seriously suggesting that someone in Australia did truly believe that the image of Leak’s cartoon was representative of all Aboriginal family life? Who’s making the racist generalisations now, Professor? The cartoon simply reflected the reality that far too many Aboriginal children come from dysfunctional homes. Here’s the context: Four Corners had done a segment showing the apparent mistreatment of Aboriginal boys in a detention centre. It was no surprise that this would send the protesters, keyboard warriors, blactivists, and other members of the victim brigade into a frenzy. But Aboriginal children have been abused and mistreated for years by their own. Why has there been no similar frenzy? Where were the protesters? Had they shown as much interest in the ongoing poor conditions and abuse suffered by countless Aboriginal children, which starts from the womb if you consider the effects of foetal alcohol spectrum disorder, many Aboriginal children would not have ended up in detention in the first place. They would be enjoying life. 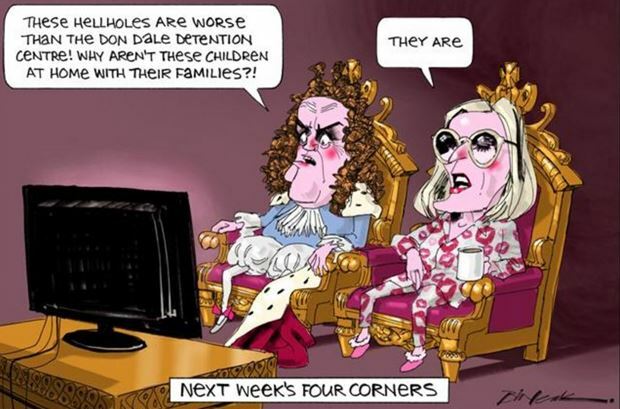 With this cartoon, Leak was raising once again the ongoing abuse and neglect of Aboriginal children living in unsafe and unclean living conditions. But there is another important question that needs to be asked here. Where were the critics calling this cartoon racist? It told a similar story to the black copper/black father cartoon that so enraged the usual suspects. What was the difference? I’m guessing that it was because Leak’s first cartoon did not feature black faces. Having said that, I believe it only would have taken one ambitious race hound to cry “racism” and other members of the victim brigade would have begun barking in unison, claiming to be “hurt and offended” by the image. They may have even pulled out the big guns and shouted “18C” or “He’s stereotyping us by suggesting that all Aboriginal kids live in hellholes.” Both cartoons told the same inconvenient truth, yet a frenzied response was incited by only one of them. What this inconsistency demonstrates is that the perception of alleged racism is quite arbitrary. Yes, there are racists in Australia, but does that make Australia a racist country? There are also some racist Aboriginal Australians. Does that make Aboriginal people a racist people? I think not. The majority should not be judged on the basis of a very small minority. Yes, let’s stamp out racism where it exists, but let’s not go out of our way to see it where it doesn’t exist because that is the easy path to take. Bill Leak for Australian of the Year. As for people who define themselves exclusively by race (do they have any other special skills, I wonder?) when is Pat Dodson going to show respect to the Australian people and REMOVE HIS HAT in the Senate? The thing is, Jody, if the theatrics of his hat and beard were taken away, there would be nothing of note left. 30,000 aboriginal university graduates – What a racist nation we must have denying so many of opportunities. There is no intention of attempting to resolve any of the real issues (not in my relatively long lifetime), only a broad political imperative to impose censorship. I well remember about twenty years ago an edition of Channel 9’s Sunday that showed the actual alcohol-fuelled domestic violence during one weekend in an NT settlement. I bet my wife then that: 1) the MSM in the following days would not even refer to this fact-based visual report (they didn’t of course, no mention at all); 2) the journos and editors that made and allowed that programme to air wouldn’t last another 3 months (they didn’t and the journos involved did comment afterwards that the cold peer silence was both widespread and deliberate. The entire Sunday program slowly slid into oblivion after that edition went to air). In twenty years, absolutely nothing has changed. I have no expectation that it will. It will only be stamped out once there’s no advantage to be gained in continuing the behaviour!! Another excellent article from Anthony Dillon. The racism campaign is required for it remains the only possible avenue for the Aboriginal industry to increase and maintain power and profits. The danger of the racism campaign is that not only can something be repeated so often and by so many that people take it as a truth, but because in essence it is a lie, the main effect is to seriously piss off well-meaning Australians who have not minded spending money to try to help but who do mind when the recipients appear so racist, by classifying as a whole, and a demonic whole, all Australians who lack Aboriginal ancestry, and ungrateful. An additional problem is that the media today is entertainment more often than it is information and sloppy subbing, or no subbing, means many articles are presented as news and information when they are simply opinion pieces. No-one demands the writer substantiate the opinion and so the gullible public takes any utterance as a fact. Amy McQuire is a classic example of this debased form of journalism. She writes for New Matilda, which clearly employs no sub-editors, or at least no competent ones, and which publishes articles on the basis of agenda and propaganda, not fact, substance and balance. Can you substantiate why and how the diminished state of Australian aboriginals diminishes myself? I bare no responsibility for the state of their nation, other than perhaps not pushing my opinion enough that throwing ridiculous amounts of money at their problems for 40 years has made their plight worse. How is improving their situation in my interests? I ask this not in a callous way, but purely to get to the root of this line of thinking. To me it seems that it’s only in my interest if I care about virtue signal to the world that we (vicious, colonial, genociding, evil people of European descent) have improved their lot and are trying to make amends (for all the evil things that my ancestors and myself had nothing to do with). If you believe that you are in some way guilty for their current situation then you’ve bought into the Frankfurt school critique of European civilisation and are a victim of Leftist guilt-tripping and brainwashing. There will always be “us” and “them” as there is with every ethnic group on the planet. It’s the human condition. Anthony Dillon’s article is spot on! The three rules are the Gospel of the offended. First, state your claim confidently and use a word like ‘blatant,’ But you can also throw in ‘Extreme Right Wing’ or ‘Nazi’ or even a phobia or two (that always helps). The second rule for pasting the racist label on others is to be emotive, Confected outrage, tears of anguish (requires onions), or even incoherent sobbing adds a good touch. Third, quote someone who agrees with you, particularly the holder of a prominent position. It doesn’t need to be factual, since no true hysteric will ever question the quote. And lastly if all else fails – Call on the faithful to rally and then use a bit of biff and brutality and then trash a few things (Like Senator Bernardi’s office). Note that this last option is extreme and calls for you to leave your comfort blanket keyboard and venture out into the real world. Yet again an excellent article from Mr Dillon. Recent events debated serves as fine illustrations of a relatively new, but fast spreading community disease: Raceopathy. This condition has the effect that a sufferer frivolously and mendaciously claims/finds racism where there is none! but most of those contaminated by the decease are found amongst “intellectuals”, media, universities and within the less classy political class. A cluster of raceopaths has been observed within our AHRC. PM Turnbull was reportedly pondering a RC, but he now says it will have to wait since it is unlikely it will lead to a single new road being built. P.S. There is a readily available cure for raceopathy. It involves ear bashing the raceopaths with facts, logic and common sense. but it can stop the verbal diarrhoea affected people invariably suffer from. I disagree. Logical arguments don’t work against the emotional. Logic doesn’t govern their lives. The tools to fight arguments of pathos are humiliation, ridicule, humour and embracing/owning of their ad hominem attack words. The very act of virtue signalling is an appeal to the group for affirmation of ones inclusion. Virtue signallers hate nothing more than the threat of being ostracised — it’s an evolutionary response, as being outed from the group in tribal societies meant nearly certain death. So next time someone calls you a racist say, “yeah, and how’s that a bad thing?”. They’re banking on you squirming and justifying yourself (and thus avoiding the argument altogether), so don’t give them the satisfaction. For the most part they can’t answer coherently why it’s a bad thing. That gives one a window of opportunity to attack them, while they’re off balance. You’ve left out the most important tool from that list – control of the public megaphones (ie. the MSM) in order to promote said humiliation, ridicule etc. Websites such as this one are fine for the miniscule numbers we have, but go nowhere near the demographic audience size needed for effective fightback. This is no blinding insight. It’s been self-evident for many decades. It’s also my experience that saying so is regarded as “negative”, which strikes me as of the same cloth as that we are supposed to be fighting. One has little difficulty in agreeing with Anthony Dillon’s discussion, but the last sentence grates: ‘Yes, let’s stamp out racism where it exists . . .’. Having spent the best part of his exposition questioning the ‘progressive’ understanding of what racism is, Dillon then applies the ‘stamp’ of certainty and then tells us it ought to be stamped out, an implied endorsement of section 18c. Now, am I simply launching an academic argument here? well no, actually. I went to boarding school at the age of seven, and experienced first hand how cruel little boys can be, particularly when unsupervised. Having received personal insults and having given out the same, I know how hurtful it all can be; but that’s not an argument for stamping it out, which it is today, particularly with over-protective parents who little realise they are turning their children into, what Jody calls, ‘snow flakes’. We employed a little ditty to counter name calling: ‘sticks and stones may break my bones, but words they never hurt me’. (Let me just remind you, this was a prep school ditty, not an adult one). Stamp it out? No, wear it, for it says more about the abuser than the one abused. We over-employ cotton wool in this day and age. I agree with you regarding the author’s appeal to “stamp out racism where it exists”. No one even knows what racism is and perhaps that should be added into the mix of rules for the outrage industry proponents: use terms in an ever-broadening way so like a net, they ensnare and demoralise more and more of your ideological enemies. The term doesn’t even need to refer to a real-life phenomenon, it may be a unicorn, but the idea and label needs to be appalling to the chattering classes. The absolute dizzy limit this evening; an aboriginal woman on Q&A (I’ve GOT to stop watching this tripe!) translating Shakespeare into an aboriginal dialect. Oh, there’s a BIG call for that!!!!!!!!!!!! I was half-expecting someone to compare Aboriginal Dream Time Stories to Shakespeare’s prose. Oh, I dunno, Jody. John Bell has been translating Shakespeare into unintelligible drivel for 40-odd years or more, so she was probably at least as credible as he is. Sat through one of his “productions” (Macbeth presumably as StarTrek, if the costumes were any guide), at the Sydney Opera House 40 years ago, and ever since we have run screaming for our sanity whenever we hear his name. Actually watching him again even on Q&A would reduce me to a catatonic wreck. I agree D T. A year or so ago I went to the Bell,s version of Shakespeare’s Macbeth. The actors were dressed in daggy modern clothes and played several parts. One old actor even played a child after two adult roles. “Drivel” is praising it. Half way through I must have thought I was on a bad airline experiencing turbulence and reached out for the vomot bag. Typo – it’s “vomit”., but the system has prohibited this comment. Once, we programmed computers, but now they re programming us. Pardon my repeating my standard response to articles on this subject. Aborigene problems will be with us as long as people insist on being Aborigines as distinct from simply Australians, regardless of ethnic or racial heritage. “The term doesn’t even need to refer to a real-life phenomenon, it may be a unicorn, but the idea and label needs to be appalling to the chattering classes.” … the same goes for ‘homophobe’ – ‘misogynist’ – ‘islamophobe’ … all words that one group in society has decided it can use to banish and exclude another group in society. Then there are the ‘pronouns’ ‘he’ and ‘she’ which can now be another source of exclusion. The major problem being that the Left controls the institutions … so it does not really matter that which illusions it uses to ‘exclude’ all those who its regards as its enemies … that is all those who can see the illusions … all those who can still think and speak. The battle for freedom remains silent beneath the tyranny of equality. Unfortunately that argument is moot in our Enlightened society. Unborn children aren’t real humans and have no rights. Aboriginal mothers have the right to do whatever they want with their bodies. You are being ironic, I hope, about unborn children not being human . . . aren’t you? With regards to ‘rights’, if one were to consider it, no one actually has any ‘rights’, not even a right to breathe: if you don’t breathe you die; if you don’t eat, same thing; if your wife leaves you, you don’t eat and breathing becomes difficult. If things happen, they are meant to be; if they don’t happen, well so be it. You have the ‘right’ to accept it, or not. The only thing worth considering is that if you make a fuss about any of it, anxiety levels go up and nobody else gives two dingo’s droppings at all. Unless you belong to a minority group, and then you have the looney left solidly behind you. We are constantly bombarded by these noisy nit pickers who are aggrieved by just about everything except their own voices.Unfortunately for those of us who actually use our brains, we are also vilified by these professional whiners who have nothing better to do with their time. Those activists who have made aboriginal people the victims for many decades have no intention of becoming part of the solution to the gap between the lives of aboriginal Australians and the rest of us. It’s a thriving industry that benefits no one except those fortunate enough to be able to access the gravy train. Labeling people who have a dissenting view on aboriginal issues as ” racist” just shows how low the nation’s moral standards have fallen. We are all Australians and there should be no differentiation or special treatment for one part of the national community at the expense of the other. Anthony, another terrific article by you. It is a shame that so much energy is wasted, by so many, fomenting confected outrage over the issues that you write about. Their energy would be much better spent actually doing something about the true causes of the issues raised – but that will never happen, because it requires confronting people (victims) with their failings & telling them to get off their butts & stop taking “sit down” money. I am a racist. I could name without hesitation ‘six races’ I despise – and in my view, for good reason. Two things earn these losers a place in my pantheon of the pathetic: claims of victimhood & demands for special treatment to make up for their deficiencies. And the list includes those woeful women who want an undeserved and unearned ‘leg up’, so to speak. Real people accept there are things they cannot do and work to overcome all difficulties in the things they can achieve. Multi-Culti Madness is for mindless morons who cannot join the dots and foresee the consequences of ‘diversity’ and disharmony. I am also a proudly proclaimed Denier 7th Dan (and awaiting my call to report to Richard Parncutt’s Death Camp for Climate Realists. I also dislike all religion and fear and despise one death cult in particular. All races, cultures and religions are not just matters of relativity – the can be matters of life and death, though that point is lost on the Kumbayah Krowd. After all, it is probably someone else (or their child who will be sacrificed. By the way, did I mention I am a European Immigrant and my wife of 40+ years is Asian. Our children are all-Australian. There are two ways to fix this problem. One. There are Australians and there are foreigners. If you like the benefits of being an Australian then throw off the Aboriginality BS and be one of us. If One does not work then we go to two; Everyone declares that they are of aboriginal heritage so we can all claim the special treatment and simply overwhelm the system so that it breaks. At least we will all be treated the same and race will not be an advantage nor a disadvantage.